About 50 retired US diplomats have written to President George W Bush to criticise current American policy towards the Middle East. 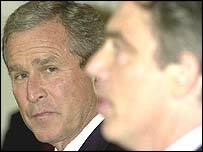 The former US envoys complain that Mr Bush's approach is losing the US "credibility, prestige and friends". They are critical of what they say is Washington's unabashed support for Israeli Prime Minister Ariel Sharon. The Middle East "Quartet" of the US, Russia, the UN and EU meets shortly to discuss the stalled peace process. It is likely to be a difficult meeting for the Quartet which sponsored the plan known as the roadmap - a process founded on negotiations and parallel, agreed steps by Israelis and Palestinians. The Quartet have divided views on Mr Sharon's plan to withdraw unilaterally from Gaza while retaining many settlements in the West Bank - a plan endorsed last month by the US president but now rejected by Mr Sharon's own Likud Party. The BBC's UN correspondent, Suzy Price, says the Quartet's high-level talks in New York will undoubtedly see a renewed call for a return to the road map, but seem unlikely to make any concrete progress. Mr Bush's backing for Mr Sharon's Gaza plan was the focus of much concern expressed in the American diplomats' letter. "We are going to have the worst of all possible worlds," said Greg Thielmann, a former State Department analyst who signed it. "We have probably done irretrievable damage in the eyes of the Arab world," Mr Thielmann told the BBC's Today programme. We're not the good guys any more... We are viewed as hypocritical. "And yet we will not accomplish what seemed to be at least one positive part of the plan, which was the giving up on illegal settlements in the Gaza Strip." The diplomats are planning a news conference on Tuesday to go public with their opposition, according to the American Educational Trust (AET), a foundation where some of the former envoys are based. "Our hope is that both political parties will take heed and listen to the voices of experienced diplomats," the AET said. "Your unabashed support of Sharon's extra-judicial assassinations, Israel's Berlin Wall-like barrier, its harsh military measures in occupied territories and now your endorsement of Sharon's unilateral plans are costing our country its credibility, prestige and friends," the letter warned. Israel says it has no choice but to kill militants planning to carry out suicide attacks, and that its West Bank barrier is for security only. The signatories say they were inspired by a similar letter written by 52 former British diplomats to UK Prime Minister Tony Blair last week. The organiser of the American missive, Andrew Killgore, who served as US ambassador to Qatar from 1977 to 1980, told the BBC: "We thought American diplomats were as unhappy as British diplomats were over what the president did." He said Mr Bush should not "take away the right of the Palestinians to return, or give Sharon the right to take settlement blocks in the West Bank which will hardly leave the Palestinians any contiguous territory". "It seems to torpedo the idea of a separate Palestinian state," he added. Mr Killgore said the letter was mainly about policy towards Israel and the Palestinians, but it touched on Iraq too. "If anything Iraq is worse," he said. William Rogers, who was under-secretary of state for economic affairs in the mid-1970s, has not decided whether to sign the letter yet, but said: "We're not the good guys any more and our foreign relations have been and are being damaged. We are viewed as hypocritical." The BBC's Jon Leyne in Washington said those in the Bush administration who do support Mr Sharon might well point out that the state department has always been a sceptical supporter of Israel. Mr Sharon himself has always made a point of dealing directly with the White House. There has been no response yet from the White House, our correspondent says, though in the past, the administration has been quick to savage its critics. "Supporting Israel is a cornerstone of this administration's Middle East policy"